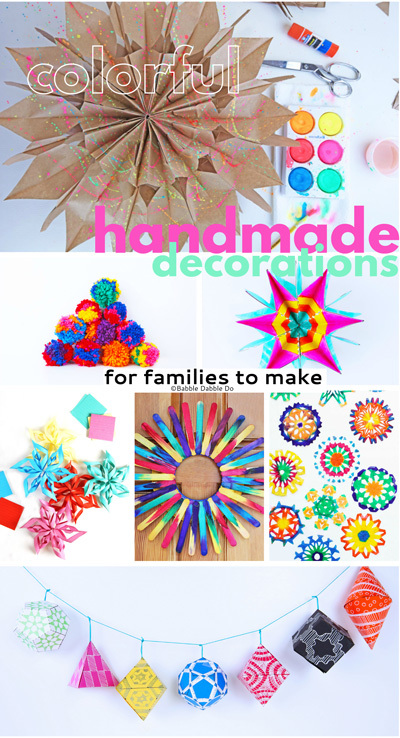 Most of these ideas are best suited for older kids ages 7+ or for a family to do together. If you have littles at home have them do the dip and dying on the snowflakes while adults cut out the shapes. 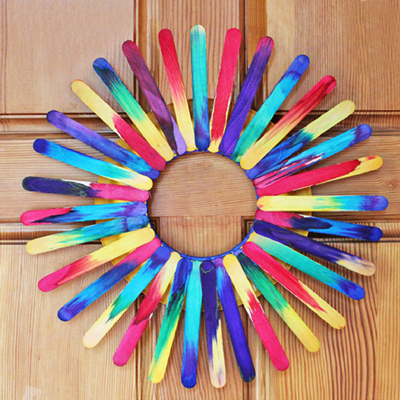 Another easy one for younger kids is the Craft Stick Wreath. All you need are craft sticks and a paper plate! The lunch bag paper stars can be made fast and are HUGE so if you need an impactful decoration in a hurry they are your answer! For older kids the Post-It Note Stars would be a great classroom activity and they are so inexpensive…6 Post-Its per star is all you need! For the truly dedicated I’m featuring couple of more involved decoration ideas at the end of the post. One year I made a collection of wrapped wreaths. They are stunning and easy to make. And our Sticky Snowflakes require some finesse when opening and sticking but look amazing on a wall or window…. 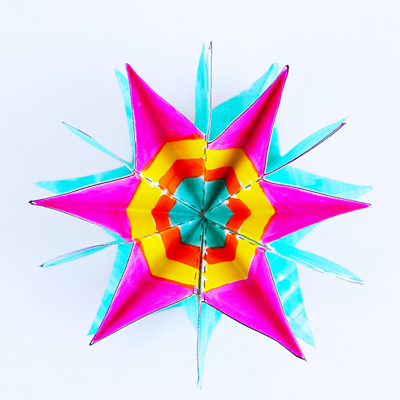 Learn how to make paper stars out of lunch bags. These can be made quickly and inexpensively! 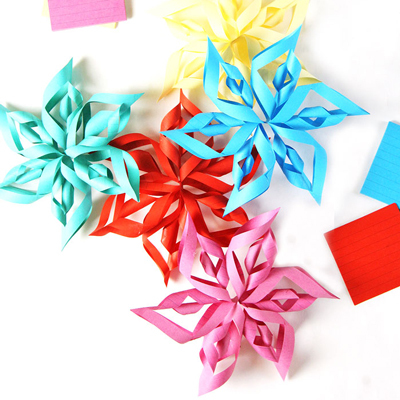 Make 3D Paper Stars from 6, count ’em 6, Post-it notes! 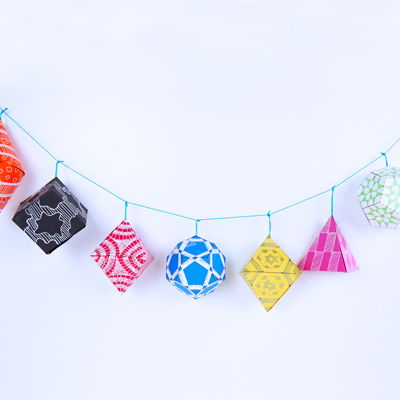 For the math fan in your life…make a garland out of the Platonic Solids! 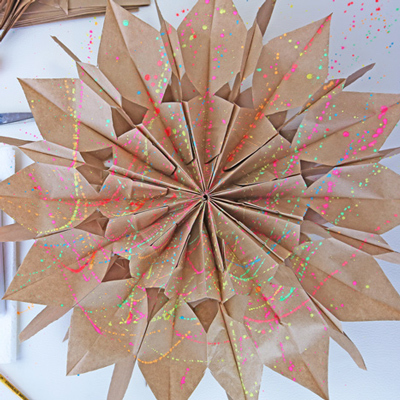 A colorful paper art project with a big reveal! These look great as gift toppers, a garland, or ornaments! 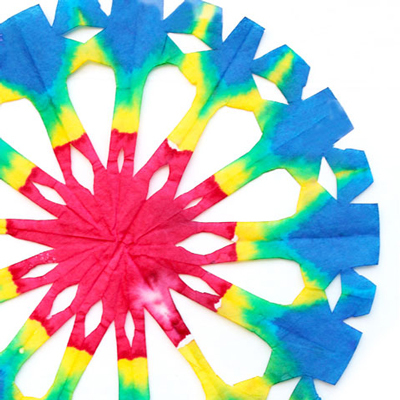 Make a Psychedelic Snowflake out of a coffee filter. Beware: These are addictive to make…. 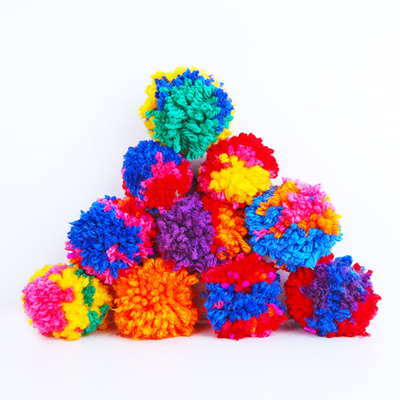 Learn how to make pom poms using two easy methods…psst…one method requires no special tools! 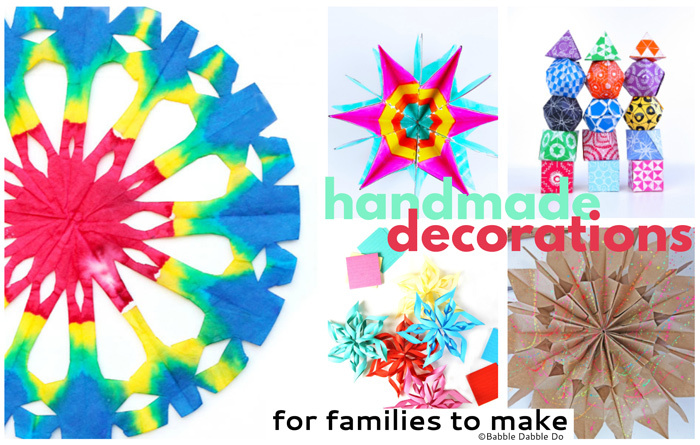 Use them as a garland, ornaments, gift toppers or turn them into a wreath! Crafts Sticks + a Paper Plate = Gorgeousness! Use red and green food coloring to make it more “Christmassy” or paint it blue and gold for Hanukkah. 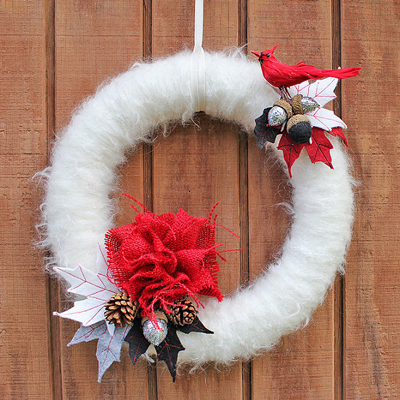 Heirloom quality wreaths you can make at a home! 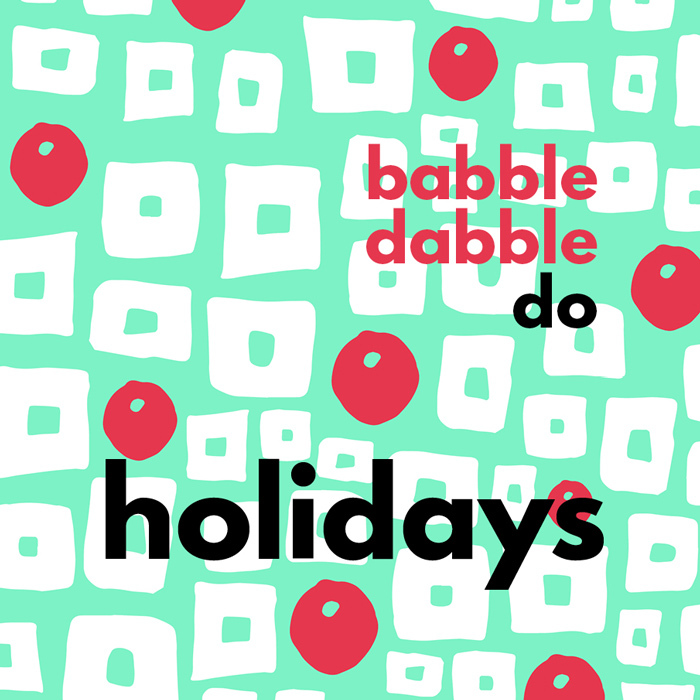 Psst…have kids do the yarn wrapping! 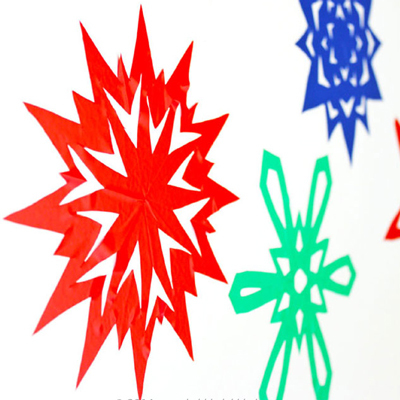 Make “sticky” snowflakes using contact paper. Fun idea for DIY wall and window clings. 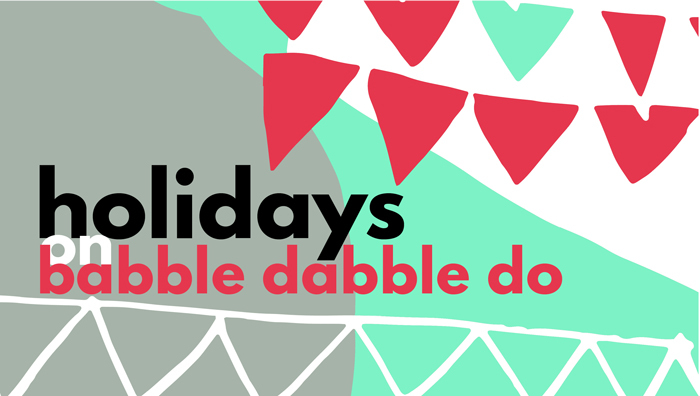 All week we are featuring holiday ideas here on Babble Dabble Do…check back tomorrow for our collection of Fun, Easy, and Creative Christmas Activities for Kids. And if you missed yesterday’s post hop over here to see Clever DIY Ornaments!